In this photo released by the Immigration Police, Chief of Immigration Police Maj. Gen. Surachate Hakparn, right, walks with Saudi woman Rahaf Mohammed Alqunun before leaving the Suvarnabhumi Airport in Bangkok Monday, Jan. 7, 2019. A Saudi woman who says she is fleeing abuse by her family and wants asylum in Australia has sent out desperate pleas for help over social media. Rahaf Mohammed Alqunun, 18, began posting on Twitter late Saturday after her passport was taken away when she arrived on a flight from Kuwait. 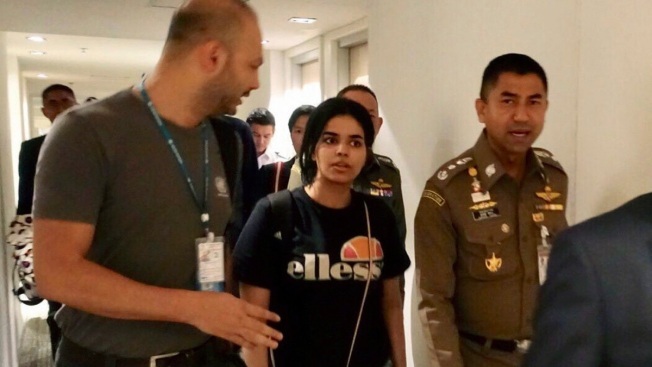 Thailand's immigration police chief met Tuesday with officials of the Saudi Embassy in Bangkok, and said the officials told him they are satisfied with how the case of a young Saudi woman who claims to be fleeing her abusive family has been handled. Maj. Gen. Surachate Hakparn explained the Saudi reaction to reporters after a meeting with its diplomats. The embassy issued a statement Tuesday denying accusations that it had requested the extradition of Rahaf Mohammed Alqunun or seized her passport, as the 18-year-old woman had charged several times. The statement said the case is a "family affair but yet, it is under the care and attention of the Embassy." "The position of two countries on this matter is the same — that the priority is to provide her safety. We are both concerned for Miss Rahaf's safety and well-being," said Surachate. "The Saudi charge d'affaires said he is satisfied and expressed confidence on the work of Thai immigration, of the Thai government, and of the Foreign Ministry yesterday." Alqunun grabbed global attention when she sent out pleas for help via social media, saying she feared for her life if she were put on a plane back to Kuwait, where she had slipped away from her family, or her homeland. Instead, she was given back her passport and allowed to enter Thailand temporarily under the protection of the U.N. refugee agency, which was expected to take about five to seven days to study her case and her claim for asylum. The office of the U.N. High Commissioner for Refugees said in a Tuesday statement that it would look into Alqunun's case "to assess her need for international protection." She has said she wants to go to Australia to seek refuge there. Surachate said Alqunun's father and brother were due to arrive soon in Bangkok, but that it was her decision whether to meet with them. On Twitter, she has expressed fear of such a meeting. The father had previously been expected Monday night. Meanwhile, Human Rights Watch called on the Australian government to allow Alqunun's entry into that country. Alqunun said she had a visa to continue her journey to Australia, but media reports say the Australian government has now canceled it. Australian officials have not responded to multiple requests for comment. While Surachate claimed Alqunun never had a visa to enter Australia, Human Rights Watch's Australian director, Elaine Pearson, said she had seen electronic confirmation of the visa, shown by Alqunun to HRW's Asia deputy director, Phil Robertson. But, Pearson said, Alqunun could no longer access her visa page on Australia's immigration website on Tuesday, sparking concern that the document had been canceled. An Australian visa is usually processed electronically and not stamped in one's passport, but confirmed by a document that the visitor can print out. Though refugee status would mean a different form of visa would be needed, Pearson said Australia's apparent cancellation of Alqunun's tourist visa was a worrying sign. "It's extremely concerning if it is the case that the visa has been canceled," she told The Associated Press, adding that Australia should allow Alqunun entry in any case. Since Australia has expressed concern in the past about women's rights in Saudi Arabia, it should "come forward and offer protection for this young woman," Pearson said. For runaway Saudi women, fleeing can be a matter of life and death, and they are almost always trying to escape male relatives. In 2017, Dina Ali Lasloom triggered a firestorm online when she was stopped en route to Australia, where she planned to seek asylum. She was forced to return to Saudi Arabia and was not publicly heard from again, according to activists tracking her whereabouts. Despite efforts by the Saudi government to curtail the scope of male guardianship laws, women who try to flee their families in Saudi Arabia have few good options inside the kingdom. They often are pressured to reconcile with their families, sent to shelters where their movement is restricted, or face arrest for disobeying their legal guardian.